Would have to be Christmas (and it's that time of the year again so it's foremost in my mind!). As I've mentioned previously, I have a very optimistic view of family Christmas - often referred to as my "Brady Bunch mentality". Each year I dig out the decorations, crank up the Christmas carols and search endlessly for a meaningful gift for each family member. I then wait for my absent children and their spouses to make the journey home - expecting that they will be looking forward to it as much as I am. The reality is often a little less glowing..... they turn up diligently somewhere near Christmas Day - never actually on Christmas Day (but we won't go there.....) and all goes smoothly, but it never has that warm, golden aura that I expect from my family gathering around me. It is all pleasant and normal but I when I look back on it, I think that the weeks of anticipation leading up to the day are a part of what makes Christmas special. Is overseas travel. Australia is a LONG way from almost everywhere (and Western Australia is a long way from our East coast). I have done a few trips overseas and interstate and I like to have months to think about them and plan for them before I go. This is because, in all honesty - and with a deal of ingratitude (and associated guilt) towards being lucky enough to have traveled - I HATE airports, waiting, security checks, cattle class seating, sitting with my legs jammed behind another seat (I'm tall), aeroplane food, swollen ankles, luggage collection, and the list goes on. I love the thought of foreign places and I love the idea of traveling and seeing things that I've only seen pictures of, but I am not a great traveler - so I can get a lot of pleasure out of thinking about the trip, about the sights I'll see etc and the memories I'll have, and that helps offset the torture of the airport and plane. Is my social life. I love the thought of getting together with friends and family. I love the thought of seeing my adult children and their spouses, I like the idea of celebrations and catching up with old friends. When I get an invitation to a wedding or a 50th birthday party or whatever, I immediately start planning what I will wear, what gift would be appropriate, who will be there and who will I talk to etc etc. When the actual event arrives I find myself sadly deflated, I am really not very good in large groups of people. I seem to have lost the ability to mingle all night long making chit chat and having a good time. I last about an hour or so and then I start planning my exit (being married to an introvert makes this part fairly straightforward - he's happy to leave whenever I am). My word for 2016 has been "EMBRACE" and I had grand plans about all the things I was going to branch out and do. I was going to sell my blogging soul to sponsors, work only two days a week, travel a lot more, find a multitude of new pastimes, and the list grew. The reality is that I don't want to sell my soul to anyone - I don't want to compromise my blog, my integrity, my authenticity to make money or friends. I would rather stay true to my values and not fight for popularity - it is enough just to feel at peace with things. I also found that I'm working more than I expected - retirement wasn't as close as I'd anticipated, and I'm not traipsing all over the world, but I'm happy and content and loving the life that has enfolded. Perhaps ultimately, I've learned to Embrace authenticity rather than achievement. So, as midlife descends on me in all its glory, I will make it my aim to enjoy and anticipate everything that is coming up and get "my money's worth" out of the looking-forward-to-it part and then just kick back and have less expectations of the event itself. I might even enjoy things more that way and reduce my 'Brady Bunch expectations' down a bit. Nobody wins when expectations come to the party - so I'm taking them off the table - along with perfectionism (another big pain!) and focusing on appreciation and gratitude instead. Anticipation caputres me. This is exactly why I love planning travel far in advance. so much longer to enjoy anticipation! I love this, Leanne! 'Focus on appreciation and gratitude instead'. This is exactly what I needed to read today. Thank you! My pleasure Diane - I think we all need to appreciate and feel appreciated more. It brings contentment and that is a joy in itself. I guess it's how you look at it. For me, I don't see myself selling my soul to run an online business. I didn't choose to work a regular job and get great joy out of blogging for pleasure and for income. It's just a different perspective is all. I can't imagine what it must be like to fly other places in the world from Australia, though, and traveling can be exhausting. But once you're at your destination, it's exciting! I think it comes down to why you blog doesn't it Rebecca. If you do it as a business, then you aren't selling your soul because you choose what you write about to fit your business profile. It's reading all the stuff that people write about really boring products that I was referring to - writing for the sake of it is not what I want for my blog - I want it to bring fulfillment. And you're right - Australia is a LONG way away from almost everywhere! 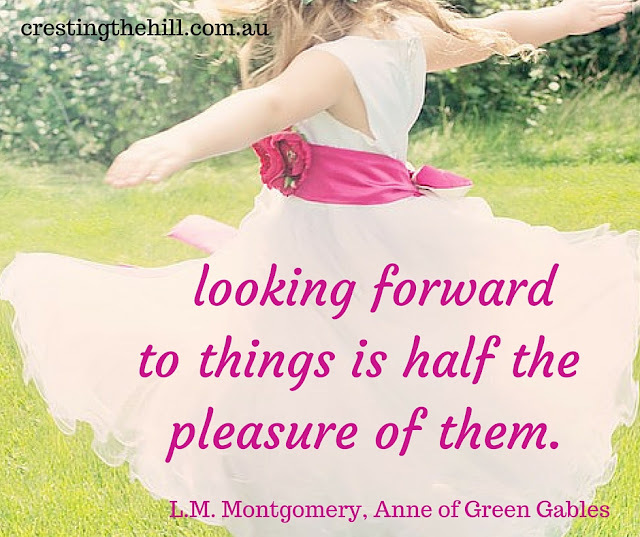 Thanks so much Lyndall - I'm trying to keep my expectations under control - with a grandbaby in the mix it can't help but be a fun day for everyone I'm sure :) Merry Christmas! I'm so like you Leanne. I put so much into the preparation or looking forward to anticipation to the event that sometimes it is a bit of an anti-climax. Love our idea of taking your enjoyment from the lead up and not just waiting for the fireworks at the event. Have a wonderful Christmas my friend and a fabulous 2017. I can very much relate. So often it's the idea or thought of something that is far more exciting than the event itself.... but I like that approach of knowing ourselves well enough to prepare for our reaction / response and manage it accordingly!